François will be speaking at the fourth #tptalks for 2018. To join us, please register here. Do you ever feel yourself getting too comfortable (be it with a particular style, type of project, field, environment, medium)? If so, what steps have you taken to shake things up? François Rappo: Yes I do, through years type design has become a routine. For a couple of months I’ve been getting curious about other graphic ‘disciplines’ that are pushed in the background today. Right now I’m collecting data about designer’s views, publications, discourses, on abstract visual languages. From Semper, Grasset to Kepes, to Munari. I feel we have the opportunity to throw a fresher view on the topic today. SpongeBob SquarePants — a courageous vision of art and life. Any idea — I try to give a chance to the most miserable idea inspired by anything, put it on the paper, on the screen, let it grow, keep it at hand, have a look on it from time to time. Type design is at first a private fun, next, if still exciting, open to a community of users. 95% of my fonts are self-initiated projects. Type design is at first a private fun, next, if still exciting, open to a community of users. In the same time, reader’s experience and expertise are the core of my projects. ‘Belle et Sébastien’ by Cécile Aubry. My typical (ideal) day/week schedule looks like: two days drawing / one day on the bike / two days drawing / one day… if possible all the year. Except that a couple of days ago I broke bike (expensive one), helmet, shoes, ribs and collarbone. I have more time for drawing since, but I’m slower for my emails. I like to start to work right out of bed, early, around 5am with a first cup of coffee. Eager to be surprised by what I did before. I only have fresh ideas in the morning. I’m working in parallel on many projects, from 10 to 20. I don’t like boring researches. It’s there or it’s not there. Then later in the day I develop initial sketches — a routine job I like to do myself. Permanent hidden dark workplace, like Frank Kafka’s basement dream. Never take a computer outdoor, please. Design is drawing. 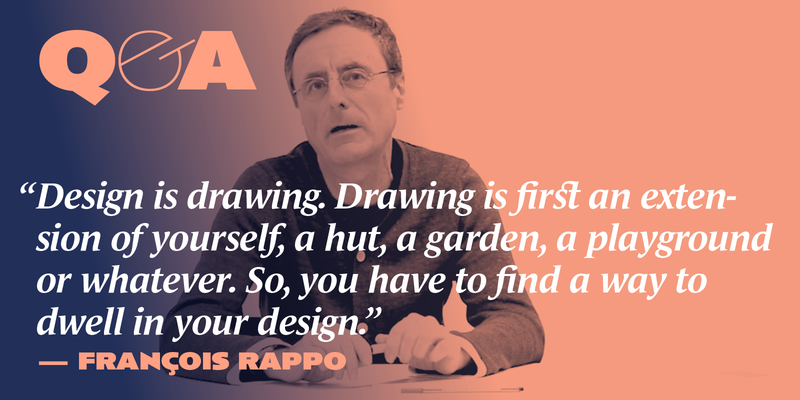 Drawing is first an extension of yourself, a hut, a garden, a playground or whatever. So, you have to find a way to dwell in your design.